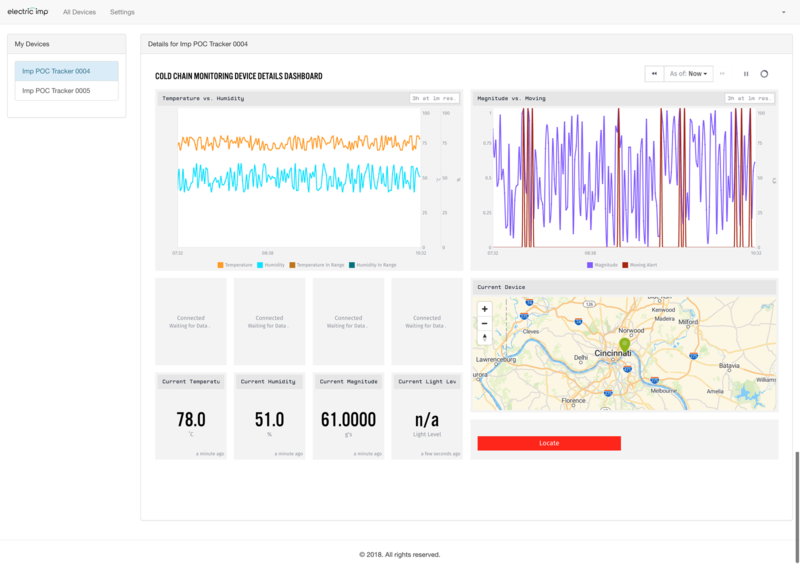 A great number of industries can benefit from Cold Chain Monitoring, or the intelligent monitoring of a temperature-controlled supply chain. It combines asset tracking and sensor monitoring in a very unique way. As the assets — items such as chemicals, produce, drugs — are moving through the supply chain, all the stakeholders need to be aware of where assets are located. Most of the time these assets are temperature sensitive, so keeping track of the temperature throughout the process is critical. Enterprises in these industries require increased transparency and access to information. This information leads to cost savings, safer practices, and extended shelf lives. Being able to offer this information can open new revenue streams as well. Doing this quickly requires the right tooling. We can demonstrate what this tooling looks like with the Losant Enterprise IoT Platform and the Electric Imp Secure IoT Connectivity Platform. Losant and Electric Imp together provide the essentials users need to go from hardware to user experience. Electric Imp provides secure connectivity and intelligence from edge devices to the cloud, and Losant delivers from cloud to experience. An experience is the application that your users or stakeholders will use to monitor and interact with data. 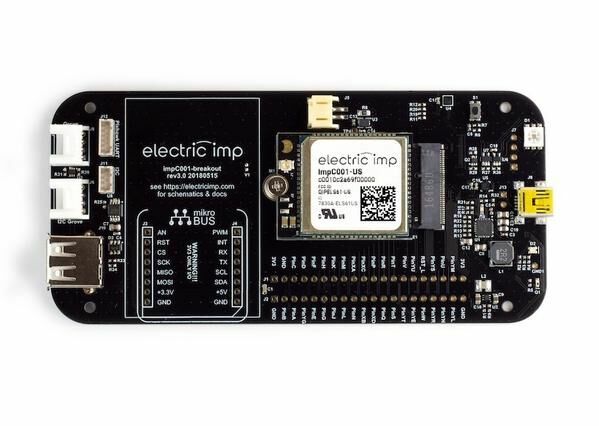 Out of the box, the Electric Imp Platform provides device hardware modules, connectivity, and managed device-to-cloud security — three major layers of your IoT stack. Electric Imp makes it simple to get devices connected with WiFi, cellular or other interfaces. Losant provides workflows, a dashboard, and an experience builder. 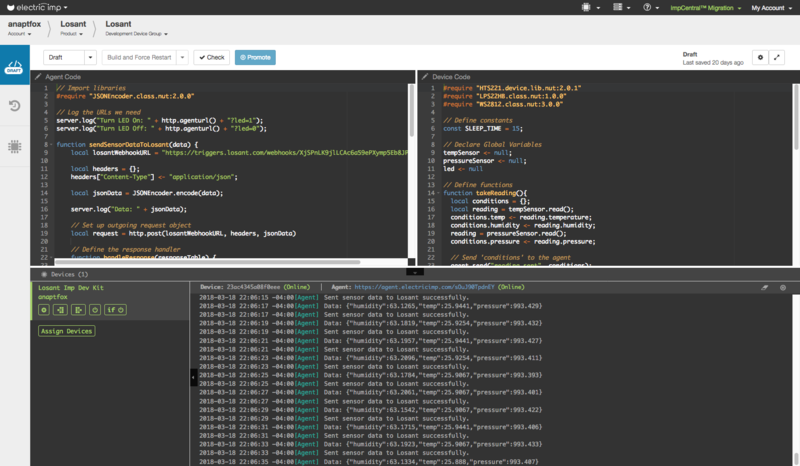 Workflows make it really easy to react to data as it’s coming in. Dashboarding allows you to display data in the best way possible. Lastly, Losant End-User Experiences allow you to build an application for your end-users, powered by workflows and dashboards. impC001 Breakout Board - The impC001 Breakout Board provides a full product evaluation, code development and product prototyping platform for the Electric Imp impCellular offering. All impC modules are fully integrated into the Electric Imp platform and pre-provisioned with multi-operator service to automatically and securely connect to the cloud via the best available network. The impC001 Breakout Board includes efficient battery operation, a wide range of I/O (including USB host, serial, GPIO, analog, and more), as well as temperature, humidity, and motion sensors and a RGB LED. As an open-source reference design it can be quickly transitioned to customized commercial hardware. 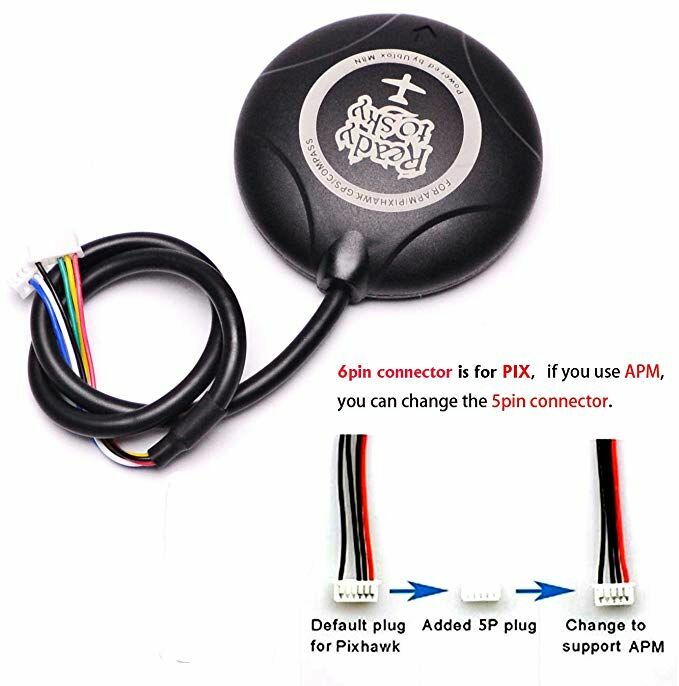 Pixhawk GPS Module - These modules, built to provide GPS functionality to drone autopilot systems, are a very cost-effective way to buy high-end GPS devices. They plug directly into the impC001 Breakout Board. Electric Imp provides a cloud-based development environment and a tooling ecosystem to make deploying to millions of devices as simple as a proof of concept. In the Electric Imp platform, the code is separated into two parts: Agent Code and Device Code, which are connected by a secure, managed link (Ethernet, WiFi, or Cellular). The Device Code runs on the impC001 module and implements the device application logic, such as reading and processing sensor information and then sends the data (temperature, humidity, movement, and GPS location) to the Agent. The Agent Code runs in the Electric Imp cloud and provides a secure and scalable integration to the Losant cloud over which the sensor data is forwarded. The Cold Chain application code can be found on GitHub (ADD LINK). Once the data is in the cloud, we can begin to create visualizations to show our data in the most effective way. Now that our device is sending data, let’s build a dashboard to see how these values are changing over time. Losant provides a drag-and-drop dashboard builder to create the right visualization to tell your story in the most useful way. GPS History Block - This block allows us to see the location history of one or many devices. Time Series Block - The sensor data (temp, humidity, motion) are all time-series data. This block allows us to see how those values are changing over time. Indicator Block - This displays a color and message based on device data. In this case, we have a visual indicator of a “Moving” or “Not Moving” asset. These are only three of the many blocks. But, dashboards are really a stepping stone to experiences. Here is where an Application Enablement Platform like Losant really becomes valuable. 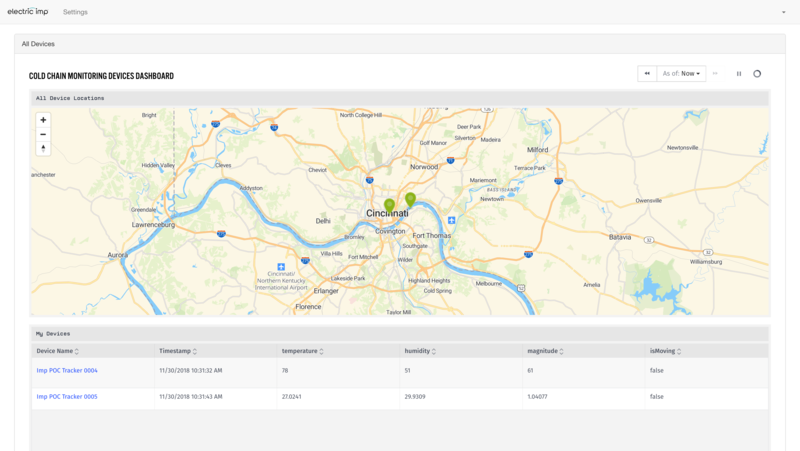 We can take the dashboards we just created and build a custom-branded UI. Experiences are where you begin to derive value from your data. In this case, all of my stakeholders can log in to an application to see where the asset is located, and monitor the temperature. The right tools allow enterprises to focus on their core business. 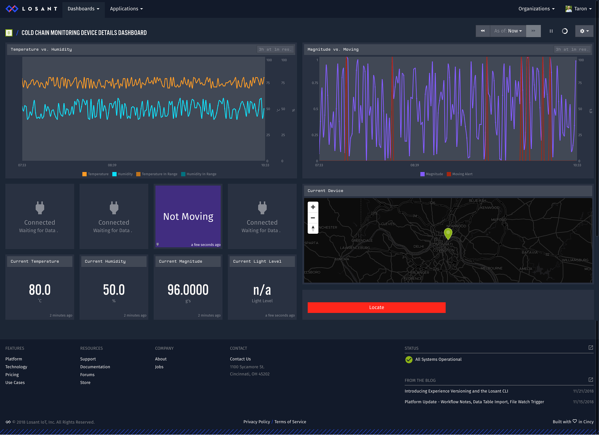 The Losant IoT platform and Electric Imp Secure IoT Connectivity Platform are tools that enable you to build fast, scale, and solve problems. Delivering your IoT business solutions has never been easier. If you have any questions, we would love to learn more about your use case.